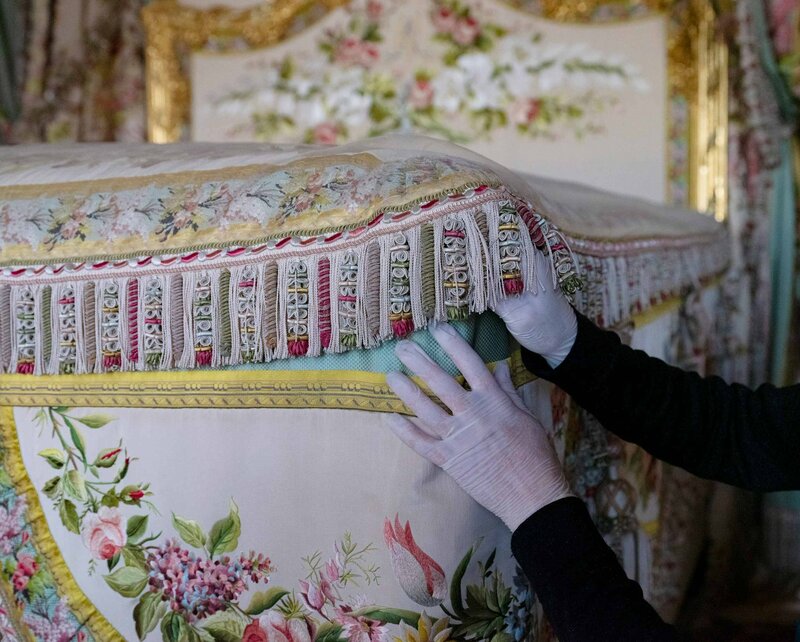 In January of 2016, the Queen’s State Apartment, the grand rooms occupied by the Queens consort of France from Louis XIV’s wife Maria Theresa to the doomed Marie Antoinette, were closed to the public as part of the “Grand Versailles” project, a massive 17-year, €500 million program to restore, upgrade and improve the buildings and grounds of the palace. The Queen’s rooms were in need of significant conservation and upgrades to the fire safety systems, utility networks, air treatment and climate control. The four adjoining rooms — the Queen’s Guard Room, the Royal Table Antechamber, the Nobles’ Room and the Queen’s Bedchamber — had been hard done by heat. King Louis-Philippe (r. 1830- 1848), seen here turning into a pear, had heaters blowing in the palace that were way too hot and couldn’t really be controlled. The heat of the summer was bad enough, raising the temperature at the highest point under the ceilings to 115F. A new climate-adaptive air system was installed with humidity regulation controls. After more than three years of painstaking labour, the Queen’s State Apartment will reopen on April 16th. In order to replace the ductwork and pipes behind the walls, the decorative woodwork had to dismantled, bronzes and textiles removed. Carpenters, goldsmiths, the silk weaving house of Tassinari and Chatel and many other artisans and trades were involved in the reconstruction and restoration. 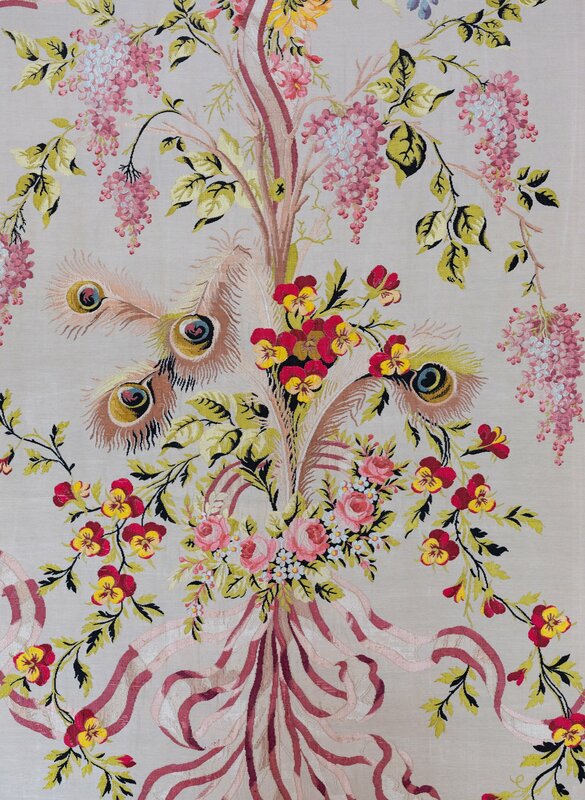 Extensive studies were undertaken to recreate the original paint schemes, restore textiles and other decorative elements. 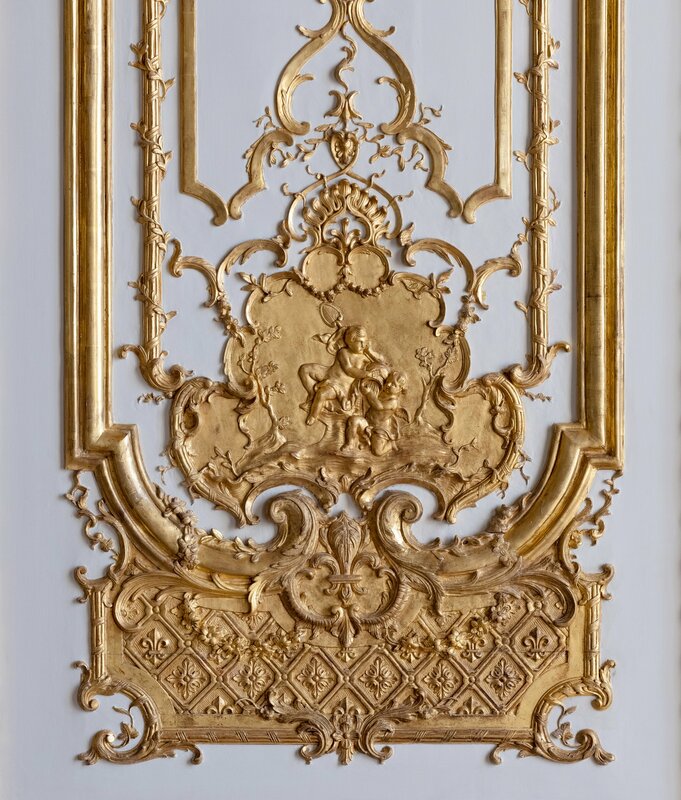 The rocaille decorations on the wall, a trompe-l’oeil technique that used plaster, rock and seashells to create the illusion of gilded swirls, crests and cupids, created for Marie Leszczynska, wife of Louis XV, was rediscovered under thick layers of overpaint. 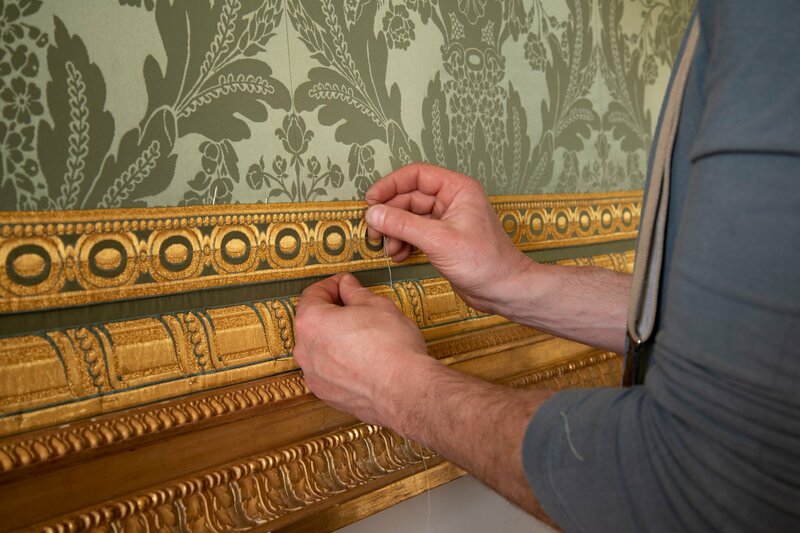 The delicate blue grey background paint has been restored making the faux gilded elements stand out again. A grisaille allegory by François Boucher’s representing the queenly virtues of charity, piety, liberality and prudence was restored to its original softness as well with the removal of discolored overpaintings and varnishes that had left the figures looking yellowed and flat. 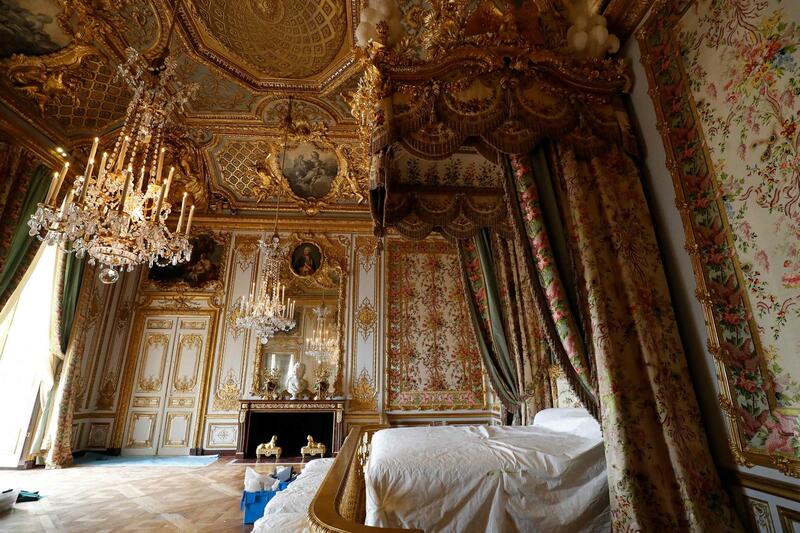 Two exhibitions will open in the rooms on Tuesday dedicated to three queens who called this apartment home and gave birth to 19 princes and princesses of France there. Marie Antoinette has the biggest name recognition, but Marie Leszczynska (who I know almost nothing about beyond the fictionalized account in the awesomely entertaining and even more awesomely confusing anime Le Chevalier D’Eon) is finally getting a little attention too, as is Madame de Maintenon, morganatic wife of Louis XIV. On a technically unrelated but in a weird way related note, the palace will be throwing a rave this summer in the Halls of Mirrors. It’s a celebration of French electronica label Ed Banger Records and will feature the label’s top four DJs spinning at the foot of the Hall of the Mirrors to the delight of crowds grinding it out on a massive dance floor that will be erected on the terraces of the Château de Versailles overlooking its impeccable gardens. Grab your gilded pacifiers and most rococo glow sticks and book your tickets for the June 8th event here. Also, Google Arts & Culture has a nifty online exhibit called Sciences at Versailles that uses artworks and objects to explore the role technology, engineering, astronomy, geography and other scientific pursuits played at the courts of Louis XIV and his successors. This entry was posted on Thursday, April 11th, 2019 at 10:13 PM	and is filed under Modern(ish), Museums. You can follow any responses to this entry through the RSS 2.0 feed. You can skip to the end and leave a response. Pinging is currently not allowed. Google Arts & Culture has a nifty online exhibit called Sciences at Versailles that uses artworks and objects to explore the role technology. Ah, now I have recovered from the quality viewing of such amazing decor, I have to say it is good to see a chicken where one would normally expect an eagle or lion. That is the most complicated bedspread I have ever seen. It must weigh a ton. 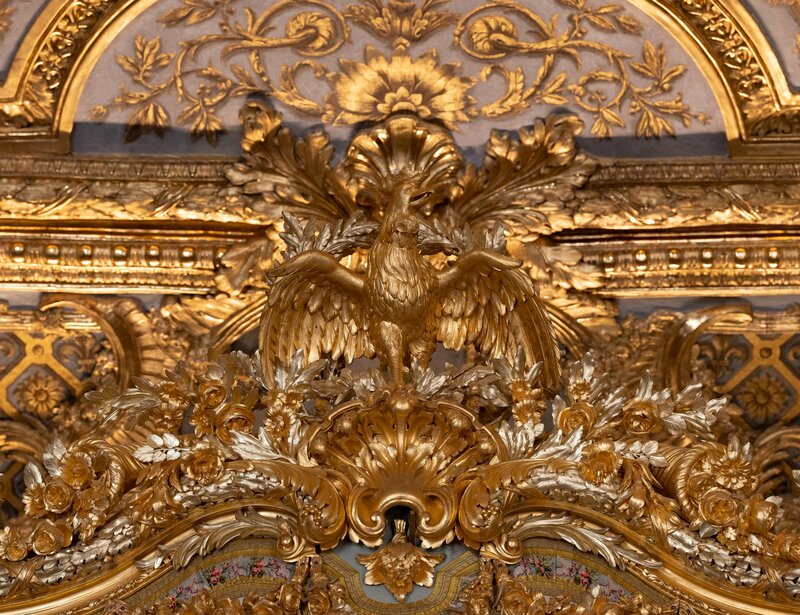 Oscar, the chicken is standing proudly in gold on the carved bed rood structure. That ‘Science at Versailles’ exhibit is fantastic. But the videos kept crashing on me…dagnabit!